NEWPORT BEACH — Newport Harbor’s recreational boaters have long shared the water with a variety of users — including commercial vessels, ferries, kayaks, electric boats, sailboats, powerboats and dinghies carrying youngsters learning to sail. Now, thanks to the growing popularity of stand-up paddleboards (SUPs), something new has been added to the harbor mix. In an effort to keep everyone safe on the water, the Newport Beach City Council has scheduled a public forum to discuss SUPs and how both they and traditional boaters can safely transit the harbor together. The recommendation for the April 7 public forum is the result of Councilmember Leslie Daigle’s suggestion that the Harbor Commission study whether increased regulation of SUP use was needed in the harbor. At a November 2012 meeting, Daigle indicated she had received various comments regarding crowding in the harbor and safety concerns — both from those seeking more regulation on SUPs, and those seeking no additional restrictions. City council members asked the Harbor Commission to investigate the issue, to determine what steps — if any — are needed to address local concerns. Over the past four months, Harbor Commissioner Paul Blank has met with Newport Beach Harbormaster Lt. Tom Slayton, commercial vessel operators, council members Gardner and Daigle, paddleboarders and recreational boaters to determine what issues, if any, were of major concern to harbor users. “After all my research, it was quite evident that additional public awareness about the existing restrictions and general boating safety would be beneficial to the community,” Blank reported to the Harbor Commission Feb. 13. At that meeting, harbor commissioners approved Blank’s recommendation to the city council to not pursue additional regulations for SUPs. He determined the existing Newport Beach City Municipal Code and Federal Inland Waterways Rules of the Road provide sufficient clarity on where, when and how to safely operate stand-up paddleboards in Newport Harbor. Under the current laws, SUPs must obey the same Rules of the Road as boaters, users must carry life jackets and navigation lights must be used between sunset and sunrise. Accordingly, the Harbor Patrol has the discretionary latitude to apply and enforce laws to promote justice and safety, Blank said. Instead of implementing additional restrictions, Blank recommended the city, along with the National Surf School and Instructors Association (NSSIA), organize a public outreach event to discuss stand-up paddleboard safety in the harbor. 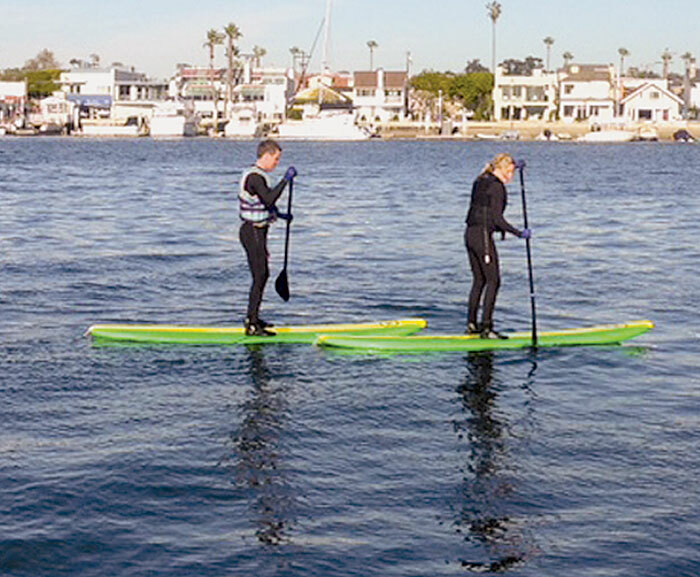 At the event — scheduled for 10 a.m.-noon April 7 at ExplorOcean, the Newport Harbor Nautical Museum — vendors will display SUP products, provide professional expertise and offer additional safety tips to participants. The public will also have the chance to ask questions of panelists, who will discuss how SUPs can safely transit the harbor and the type of safety equipment that users must carry when on the water. Panelists will include Ian Cairns, a former surf champion and a NSSIA board member; Jeff Dole, president of Balboa Peninsula Point Association and a member of SUP Alliance in Newport Beach; and Lt. Slayton. Transiting a busy harbor can be tricky on summer days when novice boaters, SUPs users and others are operating in a crowded waterway. The informational event is designed to help remind SUP users and boaters alike of Rules of the Road that must be followed while out on the water.